13 May 2016: Latin America's cities are the most dangerous in the world. Drug trafficking, gang wars, political instability, corruption, and poverty are the main causes of the continent’s extreme urban violence. 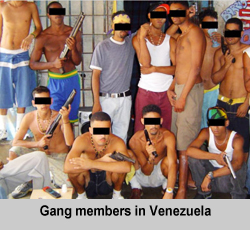 Residents of cities in Venezuela, Brazil, Mexico and Colombia are particularly at risk of being caught up in battles between warring gangs. Outside Latin America, US cities like St Louis and Baltimore as well as the South African cities of Cape Town and Johannesburg have also witnessed an increased number of homicides. With almost 4,000 murders in 2015, the Venezuelan capital Caracas is the most violent city in the world. San Pedro Sula (Honduras), which occupied the top spot in 2014, drops one place, while San Salvador (El Salvador) moves up from 27th to 3rd place. Overall, out of the 50 most violent cities in the world, 41 are located in Latin America. Four (St Louis, Baltimore, Detroit, New Orleans) are from the US. The South African cities of Cape Town, Durban, Nelson Mandela Bay and Johannesburg complete the top 50. Violent deaths in Venezuela may actually be considerably higher. Extrajudicial killings by the police and indeed any deaths involving police shootouts are not included in the government's homicide count for 2016, which also excludes deaths of unknown intent. The NGOs Venezuelan Violence Observatory and Human Rights Watch allege that attempts by the police to break down powerful gangs have led to extrajudicial killings and a steady stream of complaints about human rights abuses. Analysts from Venezuelan Politics and Human Rights also suggest that criminal gangs may have become more organised and ruthless in the face of repressing policing. While violence in Venezuela’s urban areas has increased considerably in recent years, some Latin American cities have been able to reduce violent crime. Belo Horizonte (Brazil); Medellin and Cucuta (Colombia); Chihuahua, Cuernavaca, Juarez, Nuevo Laredo and Torreon (Mexico) are no longer among the 50 most violent cities in the world. The success of Juarez on the US-Mexican border is particularly remarkable. Featured in the documentary ‘8 Murders a Day’, the city, which between 2008 and 2010 became infamous as the murder capital of the world and whose annual murder rate per 100,000 residents regularly surpassed 220, is now considered a relatively safe city which is attracting increasing numbers of tourists. *The Mexican NGO Consejo Ciudadano para la Seguridad Publica y la Justicia (CCSP) researches murder rates in the world. The rate of murder (homicidio doloso) is expressed as a figure per 100,000 inhabitants (of a city or country) in a year (abbreviated here as HTI): i.e. 50/100,000 or 50/HTI.